Who was Clement Clarke Moore? Clement Moore was an American literary professor who specialized in Oriental and Greek Literature at the General Theological Seminary in New York City. He wrote books on a number of subjects which included a Hebrew dictionary, biographies, and poetry. However it would be one poem in particular that would secure his place in American history. Clement Moore wrote a poem that he recited to his own children on Christmas Eve in 1822. Titled “A Visit from St. Nicholas,” it is now popularly known as “Twas the Night Before Christmas.” A year after he wrote the poem, a friend of Moore's is said to have submitted it to a Troy, New York, newspaper where it was published anonymously. The poem became increasingly popular as newspapers, school books, and other poetry collections republished the poem. Not wanting to sully his scholarly reputation as a professor of literature, Clement Moore at first did not acknowledge that he was the author of the poem even after others had already credited him with its authorship. It wasn't until 1844 when Moore published a collection of his poems in a book titled Poems that he finally acknowledged that he was the author. Today the poem is arguably one of the most famous poems ever written and it is still read as part of a Christmas tradition by many Americans. Since the early 20th century, Clement Moore's authorship of the poem has been questioned by descendants of Henry Livingston Jr. They claim Henry Livingston really wrote the poem. The Livingston descendants claim that Henry Livingston read the poem to his children at least 15 years prior to it being first published. Henry Livingston's son Sidney is said to have found a handwritten copy of the poem by his father. The copy passed to his brother Edwin upon his death. But the year the Livingston's first made their claim refuting Moore's authorship, Edwin reportedly lost the copy in a house fire. Today there is no proof that Livingston ever claimed authorship of the poem, nor has any copy of the poem ever been found with his name attached to it. More recently, “experts” have argued both sides of the case with support for both Moore and Livingston. 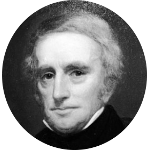 Clement Moore was born in the midst of the American Revolution in 1779. It is only fitting that some of his famous kin include patriots to the American cause including signers of the Declaration of Independence William Ellery and William Floyd, signer of the U.S. Constitution William Samuel Johnson, and Culper spy ring member Abraham Woodhull. Presidential and First Lady kin include John Quincy Adams, Richard Nixon, Jimmy Carter, Abigail (Smith) Adams, and Nancy (Davis) Reagan. Other famous kin include John Kerry, Bill Gates, Amelia Earhart, Tom Selleck, Lizzie Borden, Kyra Sedgwick, Tennessee Williams, Edward Snowden, and probably Marilyn Monroe.